Fidget toys are in the hands of many school-aged kids. Students without sensory or attention needs are playing with fidget toys on the playground, on the school bus, and in the classroom. You can find spinner fidgets in many stores. So what is the obsession with these spinning fidget toys? The fidgets are intended to provide kids with a means to occupy their hands so that they can focus during tasks that require attention. There are many children who need fidget tools in order to complete work. Most of us know the feeling: the urge to doodle when talking on the phone or the tendency to tap a foot during a lengthy work meeting. Fidgeting is a tool that helps in many situations. Fidgeting during homework or in the classroom is a common behavior. Affiliate links are included here. You have probably seen kids (and maybe your own kids) spinning these spinner fidget toys. The spinning fidgets that are in every school and classroom these days are beneficial to some students. For others, they are a cool new toy. For those that require a fidget tool to focus or attend, or have sensory needs requiring the hands and fingers to move, other fidget toys may work just as well. Fidgeting during work stimulates the brain, allowing a child to complete school work or homework. Fidgeting is mindless play or touching fingers, pencils, hands...anything that allows a person to focus on the task at hand. Kids that are fidgeting are seeking calm, and focus so that their brain can complete a task. The problem is when the brain's urge to fidget distracts a child from school tasks. They might be so wiggly and moving that they just can not sit still and focus in a functional manner. Fidgeting can be managed with less distracting techniques which can allow the child to accomplish the homework, and move on to other things. A chain of paper clips. They make a great math tool, too! Pipe cleaners and beads- Attach them to pencils as a pencil topper fidget toy. 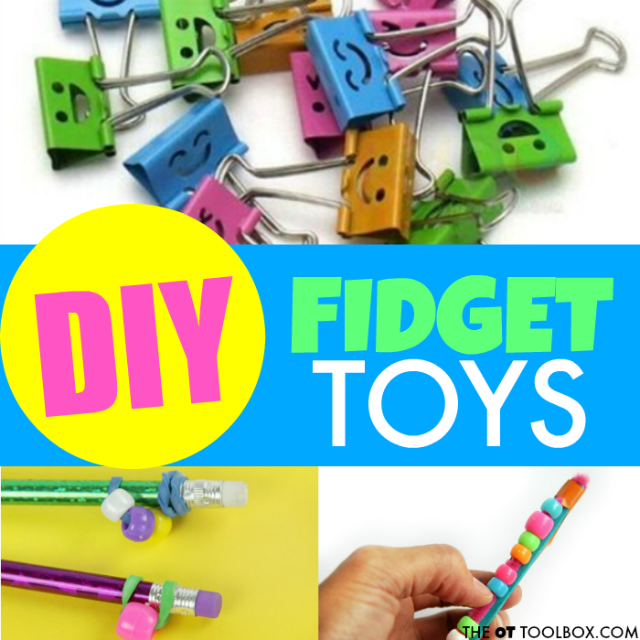 Or, use pipe cleaners and beads to make a desk-top fidget tool. Use one or more key chains linked together to make a DIY fidget tool. These keychain fidget toys are perfect. Fill balloons with a small amount of flour, play dough, dry beans, rice, or slime. Tie a knot and let kids play with the fidget tool. Use an old glove to make a weighted fidget toy. Attach a strip of sticky-back velcro inside or under a desk. Make a quiet fidget toy with small rubber bands and a shower curtain loop. A kneaded eraser work well in the classroom setting. Nuts and bolts work well during school or homework tasks. A slice of a pool noodle makes a great hand squeeze tool. 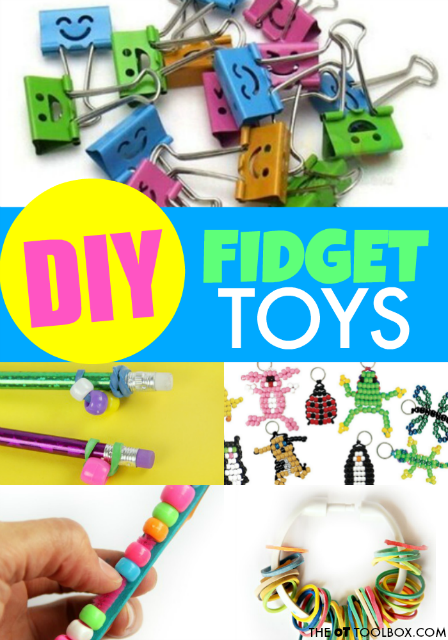 Bead keychain crafts are an awesome fine motor activity and the end result is a fidget tool that can be used every day! Attach a binder clip to a pencil. How cute are these fun face binder clips? Pipe cleaners wrapped in a loose ball. Make a paper fidget toy that doubles as a fine motor workout! These paper flextangles are too cool! What are your favorite DIY fidget toys? Do you have any favorite tools that work for your child, student, or client? A fidget tool or a fidget toy? The term fidget toy is very well known these days, with the popularity of spinner fidgets. However, there is a distinction between a fidget toy and a fidget tool. When there is a therapeutic need for a product, it is a tool. A therapy tool is one that helps meet goals, results in independence through intervention. Something that looks like a toy can be a tool for the child with sensory needs, fine motor challenges, attention difficulties, or any other problem areas.